Pick Analysis: 2015 Senior Bowl participant. In 2014, selected third-team All-American, first-team All-ACC and Butkus Award (nation's top linebacker) finalist. Led Miami with 110 tackles. Selected first-team All-ACC in 2013, starting all 13 games and setting a single-game career high with 15 tackles against Virginia Tech. Selected honorable mention All-ACC in 2012. Three-star prospect by Rivals out of high school. His father, Desmond, coached Denzel in Pop Warner football. 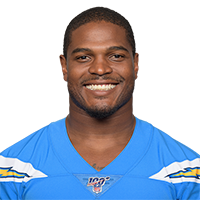 Published: Feb. 20, 2015 at 08:12 p.m.
Former Miami linebacker Denzel Perryman talks about his playing style, what NFL player he models his game after and reveals one thing fans might not know about him while at the 2015 NFL Scouting Combine. Published: Feb. 22, 2015 at 02:09 p.m. Published: Feb. 22, 2015 at 08:33 a.m.
Miami linebacker Denzel Perryman takes part in the 2015 NFL Scouting Combine workouts. Published: Feb. 12, 2015 at 06:26 p.m.
Bucky Brooks explains which NFL player Denzel Perryman reminds him of.